Before we go on, let me just say, this article is not an attack on Jehovah’s Witnesses, despite what you may think. Rather this article is an encouragement to dare to turn over the proverbial coin and see what’s on the other side. If the above statement is absolutely true then you have nothing to fear and the evidence will indict me an apostate. However, if the Watchtowers claim is false, then you need to know (2 Corinthians 10:5; 2 Timothy 2:25-26) your eternity depends on it! Therefore, I earnestly encourage you to approach this subject with an open mind as we objectively investigate the veracity and credibility of the 144,000 doctrine. Who make up the 144,000? What is the significance of 1935 and 2007 to this doctrine? Overall it will be argued that the “144,000” doctrine is a man-made non-biblical doctrine which was formulated by Joseph Rutherford in the 1930’s to fit the needs of the society at that time. As such, the “144,000” doctrine is not biblical and should therefore be rejected by Christians. This is my thesis, lets see if it holds water. According to the Watchtower organization, Jehovah has been choosing a select number of faithful Witnesses for heavenly life since Pentecost 33 A.D. The number of “true believers” is said to have plummeted after the death of the Apostles due to apostasy. Consequently, only a handful of men and women over the centuries are deemed “true anointed believers” and subsequently fit for heaven. Who then during this so-called “age of apostasy” were the “true believers”? The Watchtower does not provide a list, however one group regularly features in Watchtower literature, viz. Bible translators. Why choose Bible translators? Well, the organization sees itself as part of the history of biblical interpretation. In reality the Society had no orthodox “heritage” before its founding in 1879 by C.T. Russell, nevertheless, it engages in subtle revisionism wherein fictional links are created between past biblical translators and the organization. The result is a tapestry of so-called faithful biblical translators with whom the Watchtower Society identifies. By painting themselves into history the Society lays claim to a “biblical” heritage. The terminus point to this long heritage of translation and interpretation is the Watchtower Society itself. The “truth” essentially ends with them. I wonder though how many Jehovah’s Witnesses, when reading articles about John Wycliffe or William Tyndale, actually take the time to research the theological convictions of such men? After all, the Watchtower often claims these men were actually “Jehovah’s Witnesses”. Note in the above quotes how we are told that Jehovah has had an “unbroken line of witnesses” throughout human history. Examples of “truth lovers” listed above include biblical characters as well as Trinitarian and anti-Trinitarians. Yes that’s correct Trinitarian and anti-Trinitarians side by side. Do you know which is which? The effect is subtle yet powerful. The reader is lead to believe that all the aforementioned individuals are, at their spiritual core, “Jehovah’s Witnesses”. Other Watchtower publications frame men like Robert Morrison and John Foxe in a positive light, however these men were devout orthodox Christians and Trinitarians! How ironic, that the Watchtower – an ardent anti-Trinitarian organization – would choose to list such men as “faithful servants of Jehovah”. What a strange situation; Trinitarian apostates picked out of history and provisionally deemed “truth lovers” by the Watchtower! Even more profound is the suggestion that together such men could make up part of the 144,000! Jehovah’s Witnesses will no doubt disagree and point out that just because someone is mentioned in a positive light it does not mean they are one of the 144,000. Of course not, how silly of me! Furthermore, they would argue that it’s down to Jehovah to choose the 144,000, not man, so we should not make assumptions. That’s true. However, by drawing on Christians from past history the Society is making assumptions. They are misleading their followers into believing that these various men shared the same views as the modern day Watchtower organization; that there is some faint trail of “truth” which bridges the centuries. Nothing could be further from the truth. Firstly, not even the anti-Trinitarians believed the same doctrines as modern day Jehovah’s Witness; secondly, men like John Knox would be mortified to think that an anti-Trinitarian organization had hijacked his faithfulness and subtly linked him with their heretical teachings. In this respect the Society has no scruples and sadly members are not encouraged to research the facts themselves. Let me repeat: there is absolutely no connection between the Watchtower organization and previous generations of Christian and pre-Christian believers. Such notions are pure fabrication. Yet an even odder aspect of this, other than identifying some Trinitarians as “truth lovers” and possible candidates for the heavenly calling, is the bizarre mathematics of this doctrine. Numerically speaking, we have only 144,000 heaven-bound humans. That number, we are told, is spread over approximately 2,000 years of human history. That’s seventy-two people per year. I know what you’re thinking, as many as that! (Sarcasm intended). Let us remind ourselves of when Jehovah drew a line in the sand and stopped calling his 144,000 because the total had been completed. The final “sealing” of this limited number, according to the Watchtower, occurred in 1935 – which is actually less than 2,000 years. On “May 31, 1935 at the Washington, D.C. Convention of Jehovah’s Witnesses, it was announced anyone coming into the organization from that day on would compose an earthly class of Christians, and without question they [the members] accepted this change”. In other words, after May 31st 1935, there would be no more new members of the 144,000 anointed class. What though do the official Watchtower records reveal? Let us see. “In 1935 the Memorial attendance worldwide was 63,146 … and of those 52,465 were participants” That means that between Pentecost 33. A.D. and 1935 a period of 1,902 years, there were only 91,535 true believers, that’s 48.1 individuals per year! Furthermore, if we accept that large numbers of true believers were martyred in the early centuries under Roman rule then the percentages drop further. The Watchtower acknowledges this. Now the Watchtower Society acknowledges that most Christians before the end of the first century were true believers and that the great apostasy took place after the death of John. A low estimate is that by the end of the first century there were at least 65,000 Christians. If we add that figure to the 1935 figure of 52,465 anointed Watchtower followers, what happens? Let’s do a quick calculation. That would mean that during this period God could only find an additional 14.46 true Christians per year throughout the entire world. This figure does not take into consideration the 40,000 martyrs that died in the year 95 A.D.! (Cf. Halley’s Bible Handbook, Pages 843-845) Oh dear – It’s not looking good for the 144,000 doctrine, the figures just don’t add up! To seal this historically I return to John Foxe. Watchtower literature hails this Puritan leader as a hero, a man who spoke out against Catholicism and high-Anglicanism. During his lifetime Foxe wrote a book entitled, Foxe’s Acts and Monuments of the Church (better known as Foxe’s Book of Martyrs). According to the book of Revelation a Martyr (μάρτυς) simply means a “witness”. Jesus is called the “Faithful μάρτυς – or faithful witness (Rev 1:5). Likewise, those who would die rather than deny Jesus are called faithful μάρτυς – witnesses (Rev 2:10, 13). Martyrs are promised heavenly life (Revelation 2:26, 6:9-10, 20:4-5; Matthew 10:28-33). How many Martyr’s or faithful witnesses does John Foxe list? According to calculations by Russell Warren the total stands at 254,502, which includes mass killings. This figure is 110,502 more than the 144,000 limits! How then can the Watchtower acknowledge Foxes work yet ignore the figures? Well it’s easy when you are the “creator” of “truth” – you simply ignore, change, or adapt “truth” as required, which is exactly what the Watchtower organization has been doing since its inception. Let us see if we can make more sense of the figures between 1935 and 2015. According to Watchtower doctrine, with the passing of each subsequent year from 1935 onwards, the 52,465 partakers should naturally decrease as individuals die and go to heaven. Therefore, by the year 2015, of those 52,465 partakers in 1935, how many would we expect to still be alive and partaking? If we say the youngest “anointed” Witness in 1935 was 15 years old he/she would be 95 years of age by 2015 – so at a rough guess I would expect memorial partakers to be very, very, old and miniscule in number. In fact if we look at the demographics for the UK, in 2011 476,000 people were over the age of 90 (0.8 of the population). According to online statistics there are approximately 132,000 active Jehovah’s Witnesses in the UK. Applying the population demographics for people aged 90: 0.8 percent of 132,000 is 1.056. In other words only one person in the UK should still be partaking of the emblems! However, when you compare that figure with the official Watchtower records there are perplexingly different statistics. How did the Watchtower Society deal with these anomalies? Did they objectively go back over the “144,000” doctrine and re-examine its validity against scripture and common sense mathematics? No, instead in 2007 the Society changed its official policy announcing that 1935 was NOT necessarily the terminus date for the anointed class! Am I hearing you right? For 72 years you said the heavenly door was closed in 1935, now you say it’s still open? On whose authority was this decision made? Where is the scriptural evidence for this change? No such verse exists. 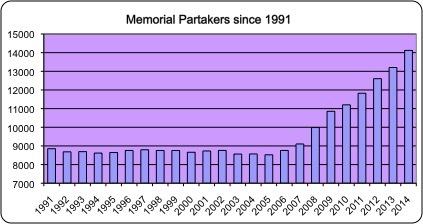 Interestingly since the 2007 revision the number of partakers has increased significantly. The Watchtower addresses these continuing anomalies by suggesting that not all partakers are genuine. “Does this total represent the number of anointed ones on earth? Not necessarily. A number of factors — including past religious beliefs or even mental or emotional imbalance — might cause some to assume mistakenly that they have the heavenly calling. We thus have no way of knowing the exact number of anointed ones on earth; nor do we need to know.” (Watchtower 2011 Aug 15 p.22). Clearly many Jehovah’s Witnesses are re-examining scripture. Sadly many remain Jehovah’s Witnesses but return to pre-Rutherford doctrines (as appears to be the case above), but at least these ones are going in the right direction, thinking for themselves and seeking truth. If you are a born again believer please pray for these lost but searching Jehovah’s Witnesses. If you are a confused Witness please read on. Note again Paul speaks in universal terms, “everyone who believes” – no mention is made of a limited class. Salvation, i.e. eternal life, is offered to all. If you are a Jehovah’s Witness please read carefully the promises that Jesus has made to all who believe. An eternal heavenly home is offered to all. At the consummation of the age a new earth and new heavens will be created in which the true believer will live eternally, face to face with Jesus. Wow! (cf. 2 Peter 3:10-12). “Then I saw a new heaven and a new earth, for the first heaven and the first earth had passed away, and the sea was no more. 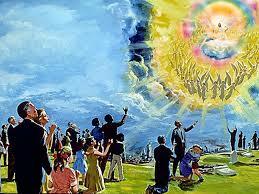 And I saw the holy city, New Jerusalem, coming down out of heaven from God, prepared as a bride adorned for her husband. And I heard a loud voice from the throne saying, “Behold, the dwelling [literal habitation] place of God is with man. He will dwell with them, and they will be his people, and God himself will be with them as their God. He will wipe away every tear from their eyes, and death shall be no more, neither shall there be mourning, nor crying, nor pain anymore, for the former things have passed away.” (Revelation 21:1-4). Please read the revelation carefully. God promises to “dwell with man”. Don’t be fobbed off with a “Paradise Earth” wherein you live apart from Jesus – such notions are the inventions of men. Just as Jehovah walked with Adam in Eden so again a full relationship with Jehovah will be restored (Genesis 3:8; Galatians 3:26). Therefore I urge all Jehovah’s Witnesses to “come to Jesus”, the source of eternal life (Romans 8:11). Enjoy and experience fellowship with the living Christ, the divine Son of God. Jesus promised; “And if I go and prepare a place for you, I will come again and will take you to myself, that where I am you may be also. (John 14:3). That is the future of all who believe in Jesus; salvation by “Faith alone in Christ alone” (cf. Romans chapter 5). We began by investigating the “144,000” doctrine from the perspective of “who makes up the 144,000?” In doing so we touched on the curious way the Watchtower Society attempts to link itself with a so-called “remnant” of Jehovah’s Witnesses from past Church history, especially those who were involved in biblical translation. We noted how by conjoining Trinitarians William Tyndale and John Wycliffe with Socinianists such as Wolfgang Fabricius Capito, a mythical bridge to the past was created. However, let us be clear, to suggest these men were all “truth lovers” and on the same page as the modern day Jehovah’s Witnesses is pure fiction and should be rejected as nonsensical. These men do not make up the mythological “144,000” nor are they the spiritual fathers of the Watchtower. Our mathematical investigation considered the period between Pentecost and 1935. We discovered that the opportunity to be one of “144,000” during that period was pathetically low with various estimates from 48.1 to 14.46 people per year. Even if we accept these low averages, when we examined the number of martyrs for that same period we found those killed for confessing belief in Jesus – ranged from 40,000 under Nero (95 A.D.) to an overall estimate of 254,502 – the latter figure destroys the “144,000” limits. Furthermore, after examining the inconsistencies between the final calling of the 144,000 in 1935 and the increase in memorial partakers after 1991, we noted that such anomalies resulted in the complete overhaul of a 72 year old truth, viz. that in 2007 the door to heaven which was thought to be closed in 1935 was actually still open! When we evaluate these discrepancies, mathematical inconsistencies, age anomalies of modern day partakers, the revisionism of the 1935 doctrine etc. the incontrovertible evidence is that the “144,000” doctrine is a lie – it simply does not work – it is simply “maths and madness”. Therefore our overall analysis strikes a deathblow to this aberrant Watchtower doctrine. We can declare that the “144,000” doctrine is the man-made invention of Joseph Rutherford and therefore non-biblical, so should be rejected by Christians. The truth of the matter is far from limiting heavenly life – as Rutherford proposed – the scriptures declare that “whosoever believes in Jesus” will attain to heavenly life. That number is not fixed at 144,000. Instead the equation is a simple one; through “faith alone in Christ alone” a person, here and now, can be eternally saved and destined to heavenly life. There you have it. There are no hidden “clauses” or “special knowledge” required. The door is open to all and Jesus is knocking! I pray that Jesus’ words find resonance in your heart. If you are an active or inactive Jehovah’s Witness please don’t accept the 2007 revision or the various lame excuses presented in Watchtower literature. Don’t be fooled by the smooth talking. Instead take a deep breath, pray for courage and boldness and take a step of faith: do your own research on the “144,000” doctrine. I promise you Jehovah will bless your efforts and lead you into all truth, viz. Jesus. The only factual connections are to the Seventh Day Adventists and earlier heretics such as Henry Grew. The Society has no connection whatsoever with biblical scholarship outside of itself nor with any historical translators. Although the society continues to quote modern day scholars where it fits their theological bias. Jehovah’s Witnesses in the Divine Purpose pp.8-9. I have approximated a figure of 2,000 years; a more accurate figure would be 1,982 years beginning at Pentecost 33 A.D ending 2015 – the date of this article. Jehovah’s Witnesses Proclaimers of God’s Kingdom p.717. 144,000 total places, less 1935 figures, 52,465 = balance of places 91,535. Various “theologies” have evolved around this term. Personally I believe God foreknows those who by God’s grace will respond to the Gospel. In other words, that which God foreknows he “predetermines or appoints”. However I reject hard determinism, while at the same time respecting those who hold to this philosophy.